If you've seen the announcement I posted earlier, I have added FlashChat to the website. 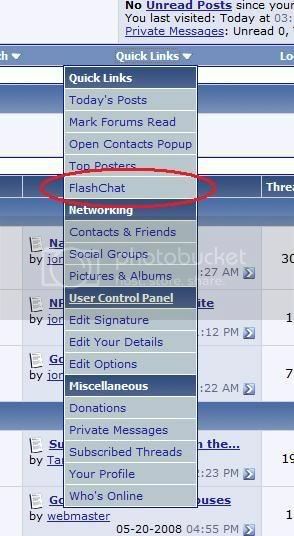 What is FlashChat? It is a program that enables you to chat, similar to AOL Instant Messenger, or Windows Live Messenger. The only thing is that it is only for registered members of Information Warriors. Plus, you don't have to register anywhere else to take advantage of it. Once you click on either, it will automatically log you in (it's tied into the user base here on Information Warriors) and you can chat to your hearts content! Flashchat appears to be down at the moment. We're working the issue and will let everyone know when it's back up. I think I've figured out why, and it's going to require some upgrades. Hopefully I'll get to it this weekend. FlashChat is fixed. I learned WAY more than I wanted to about database tables and the like. You homos better use it.